Are Oofos good for people who need recovery shoes or plantar fasciitis support? About two years ago I went to a fitness convention to brush up on continuing education credits to maintain my group exercise certification. At the conference, I saw a woman who was wearing a pair of bright purple flip flops. They looked super comfortable and padded. Intrigued, I asked her what they were, and she told me all about her Oofos shoes and Oofos flip flops. The moment I got home from the convention, I researched Oofos recovery shoes online and bought my first pair. Since then I’ve been hooked on the comfort and revolutionary foam technology of my Oofos shoes! Now, I own both a pair of the Oofos sneakers and the Oofos flip flops. Both are incredible comfortable and functional. Especially for people with joint issues (like me) or who are looking for the best shoes for plantar fasciitis (like my husband, Ken). Oofos was founded in 2011 by four footwear professionals. They collaborated with a foam chemist to develop a supportive and comfortable foam that they call OOfoam™. The founders researched OOfoam™ for years, and tested them on real-life runners and people who experience joint pain. Through their research and study, they found that Oofos shoes and sandals absorb 37% more impact than traditional foam found in other athletic shoes. Because OOfoam™ is paired with a revolutionary foot-bed design, the shoes reduce demand on the joints and muscles of the hips, knees, ankles, and feet. A lot of athletes slip on the shoes after a workout to recover post-workout. I think that sort of Oofos shoe review speaks for itself! Since I had hip labral tear surgery in April 2018, I’ve been looking for the best shoes for hip pain which have a lot of support and padding to absorb shock. 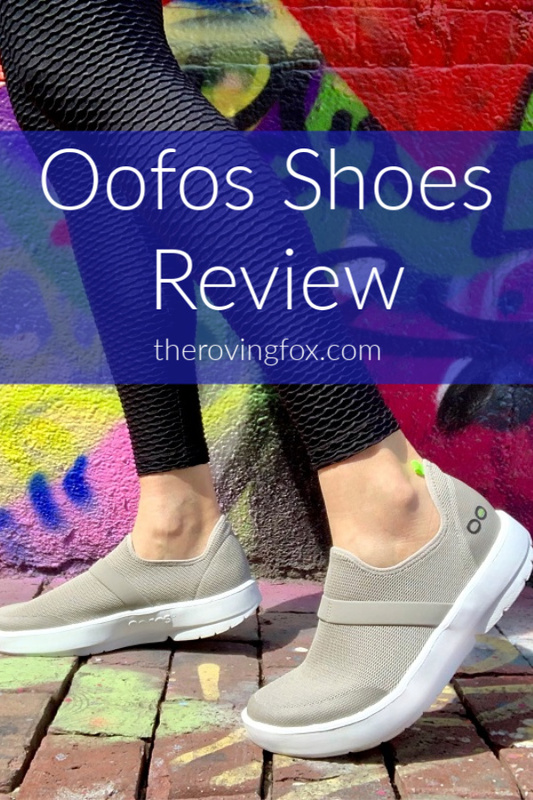 Oofos shoes are a great post-op shoe option because they are very light weight, easy to take on and off, and are super padded and comfortable. There’s a chance I might have some early hip arthritis due to my torn labrum and wear on the hip joint. The Oofos sneakers help absorb shock from walking on hard surfaces. I could see these sneakers being really effective for people with arthritis. Not only because of the foam padding, but also because they are so easy to take on and off without having to tie laces. 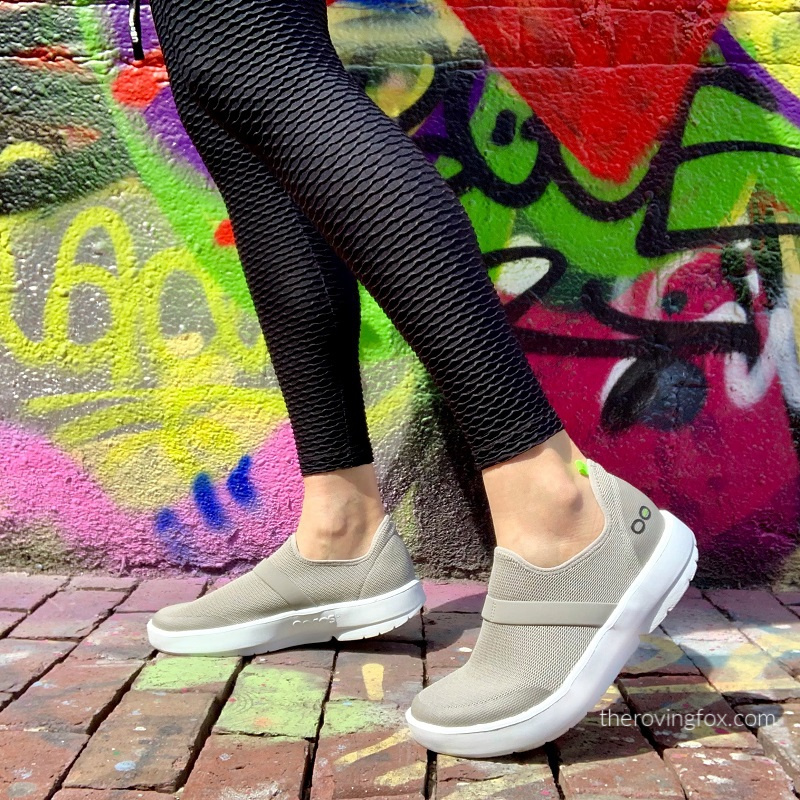 The Oofos sneakers are so comfortable to wear after a long day of work or a hard workout. It’s so nice to slip on the shoes at the end of a long day when my feet and legs are aching! The arch support seems to distribute weight more evenly across the whole foot. The women’s Oofos shoes come in neutral colors like grey or black, and vibrant colors like hot pink, blue, and orange. The shoes add about 2 inches to your height. That’s how much foam and padding is in there! I love feeling extra tall, even though I am already about 6′. These shoes are great for anyone who is on their feet all day, people with sore joints, or anyone looking for some cloud-like foot relief. I bought purple Oofos flip flops because my husband Ken is a notorious “stuff swiper.” Since we wear similar sizes in clothes and shoes, I thought the “lady color” would dissuade him from taking a stroll in my shoes. But one day I came home and he was wearing my purple flip flops around the house! That’s when I knew we had to order him a pair of his own…in black. The Oofos sandals and flip flops are made with the same OOfoam™ technology as the Oofos shoes, so they also absorb tons of shock. 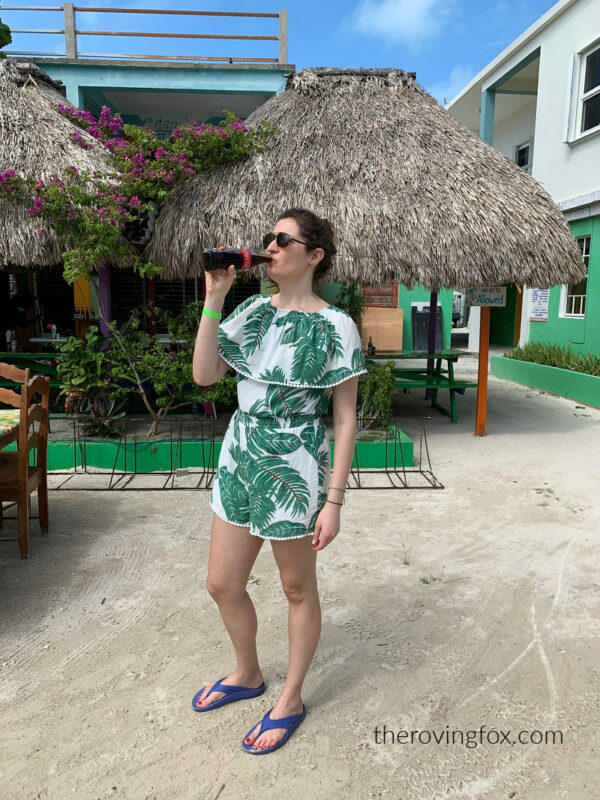 We literally live in our Oofos flip flops from May to September, and break them out any time we go on vacation in warm weather. These are easily my favorite flip flops. I love the comfort and the color, and I can wear them for a full day of walking! I’ve walked all around Disney World, throughout Mexico, and all around Boston with ease. I’ve worn them walking, biking, and hanging around the house, and I love how supportive yet padded they are. While you can machine wash the Oofos sandals, I have never noticed that they get smelly, even after weeks of daily wear in warm weather. We’ve owned our sandals for about 18 months. They’ve held up extremely well since we both average at least 10,000 steps per day. They seem to be just as supportive and padded as day 1. The Oofos flip flops come in a variety of colors like purple, pink, black, silver, and navy. They also sell an Oofos sandal which is more like slide if a more traditional flip flop style doesn’t work for you. Oofos flip flops and sandals start at $49.95. As mentioned above, I had hip surgery, so I love that Oofos shoes and Oofos sandals take pressure off my joints. But Ken has plantar fasciitis and is always on the hunt for the best sneakers for plantar fasciitis. He swiped my purple flip flops bcause they felt so good on his aching feet! He says wearing the Oofos flip flops is like walking on clouds. The shoes distribute weight over his whole foot, so all the pressure isn’t building up in one area of the foot. He thinks the Oofos sandals are some of the best walking shoes for plantar fasciitis. His sandals have also been over Disney World and on tropical vacations! They provide a lot of plantar fasciitis support and shock absorption. I am just waiting for the moment he decides he is also going to permanently steal my Oofos sneakers!! He’s worn them around the house and has already said he thinks they’re one of the best sneakers for plantar fasciitis he’s ever tried. 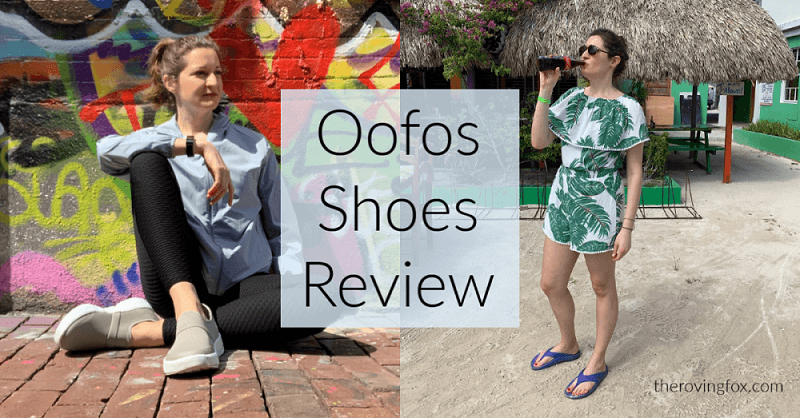 If this Oofos review helped you decide to try a pair of these comfortable Oofos shoes or Oofos sandals, please leave me a comment below! I’d love to hear from you if you end up trying a pair. Especially if you are looking for the best shoes for plantar fasciitis or the best shoes for joint pain. These recovery shoes have become staples for everyday use, and I think you’ll love them as much as we do! 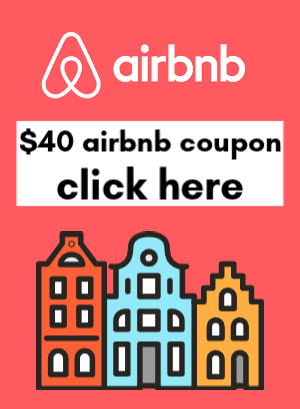 Disclosure: This site contains affiliate links. That means The Roving Fox might make a small commission if you purchase something I recommend. There is no cost to you. I purchased the Oofos flip flops myself, and the Oofos shoes were provided to me for review purposes. Thank you for your support of the blog!